Our oldest turned 7 today! 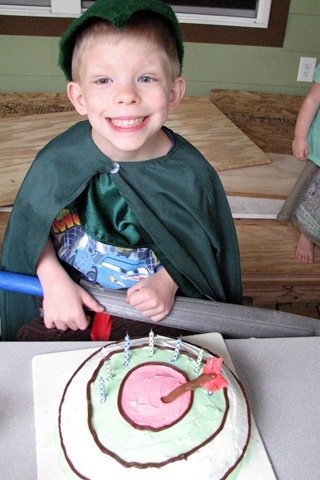 He is full of imagination and boyhood; he loves weapons and dress up. 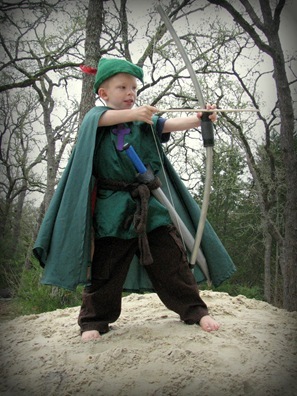 His current hero is Robin Hood. 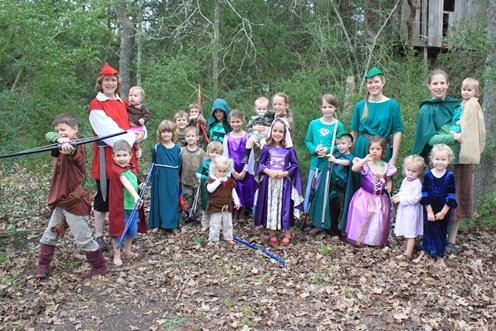 Today we all became the merry men of the forest…or maybe the merry women and their fearless leader. We invited a few others to join our band and the festivities commenced! 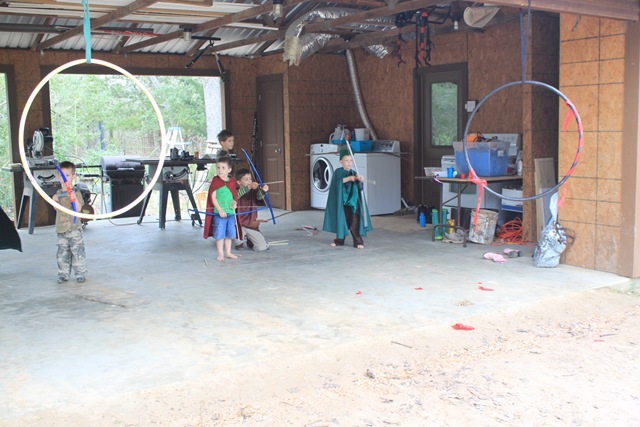 First came archery practice – shooting arrows through the hoops. The girls opted for a game of bean bag toss. 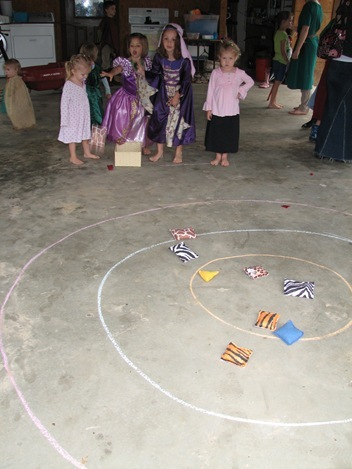 I don’t think the boys even bothered with this game, they were too busy shooting. Next, Little John (a.k.a. 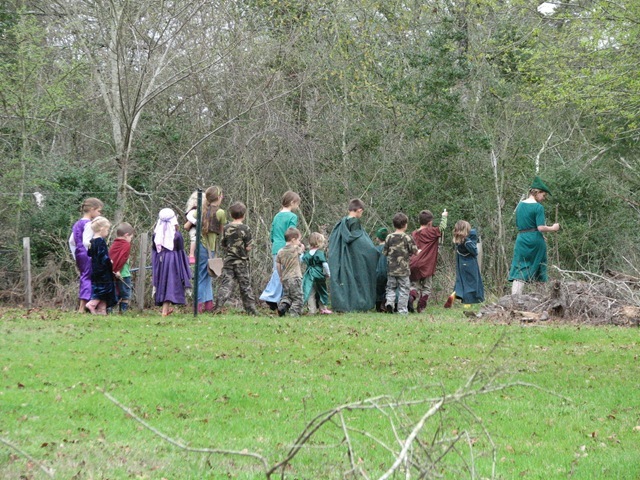 Aunt Katie) led the band through the forest. This gave Friar Tuck (a.k.a. me) time to prepare the woodland feast. 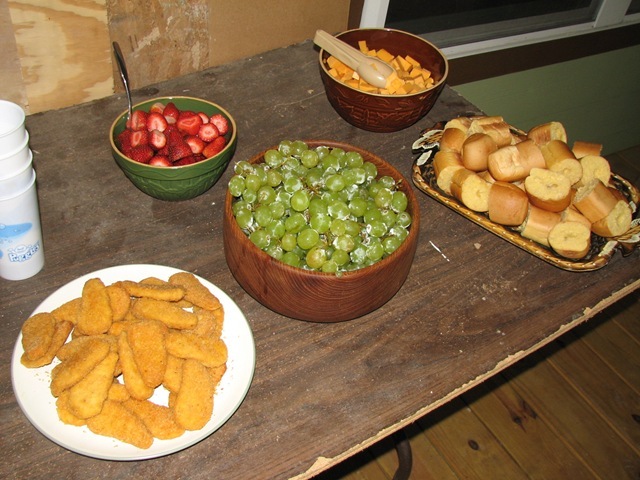 Bread and cheese, fruit and chicken nuggets were set out for the crowd. 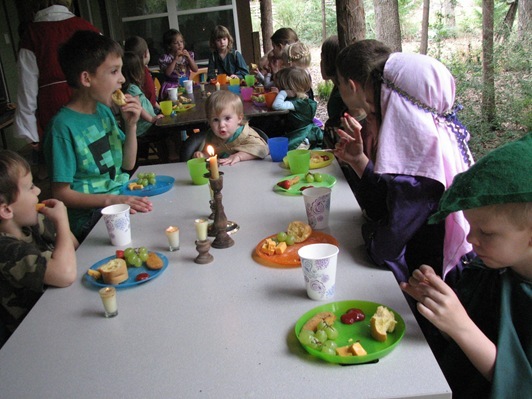 We all dined happily among the green trees (on our back porch). Lance had a target cake with an impromptu arrow made from a tootsie roll and starburst candy. After cake was presents! I had fun wrapping this one. 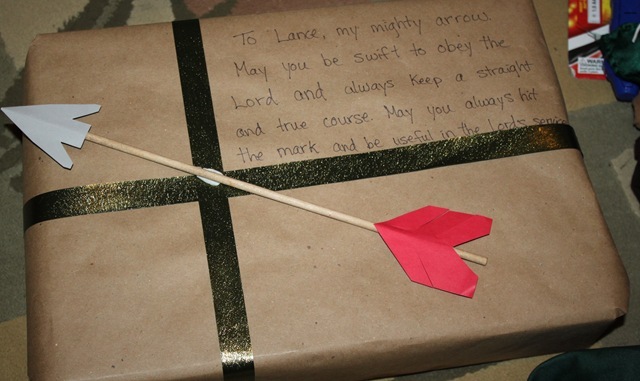 It says: To Lance, my mighty arrow. May you be swift to obey the Lord and always keep a straight and true course, May you always hit the mark and be useful in the Lord’s service. Last activity was a treasure hunt. We had made two sets of clues – indoor and outdoor – due to rain in the forecast, so we split up the boys and girls and ran both sets. 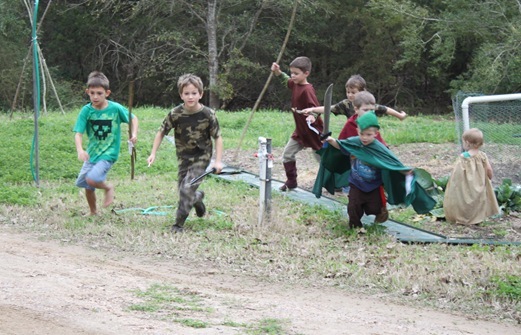 We had the boys running back and forth all over the place! Treasure was found and fun was had by all. Happy birthday, Lance! So glad y’all are doing well. Congrats on the newest upcoming addition to your family. Everyone looks do happy! Again, fabulous ideas!! 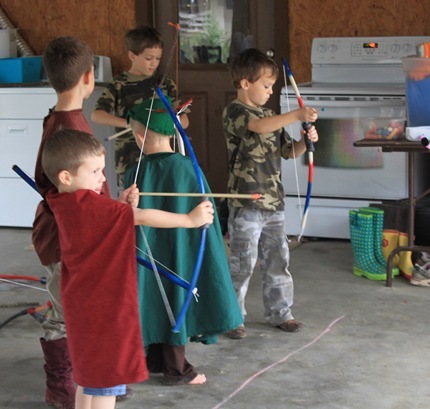 I remember when Joshua dressed up as Robin Hood. He and his friend really had fun with this. I still have pictures sitting around with them in their costumes. Loved it! And love that precious boy! I like that bullseye cake. You were Friar Tuck!! That is too funny! 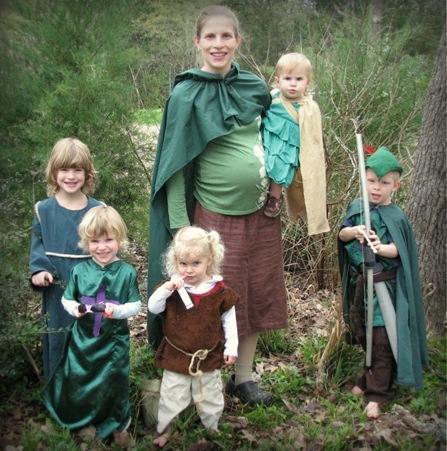 You come up with such neat ideas…hope I can be a mom like you. And I cannot believe that it’s been 7 years already!!! Happy Birthday to Lance, and love to your sweet family!